OliveOilLovers.com currently ships throughout the 50 United States and the District of Columbia from our facilities in Northern New Jersey. Though it isn’t required, we prefer to ship to physical addresses over P.O. Boxes and may reach out to you to request a physical address for logistical reasons. We currently do not ship internationally or to APO/FPO addresses. We are not responsible for packages that are shipped to international reshippers once the initial delivery has been made. We ship to all 50 United States and the District of Columbia using the United States Postal Service (USPS) and United Parcel Service (UPS). 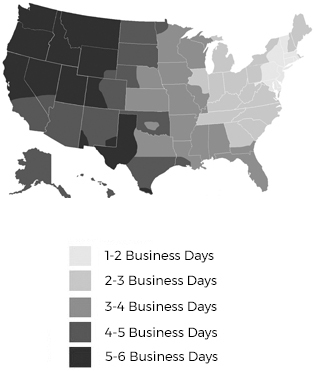 Orders typically ship out within 1-2 business days from the time the order was placed. Refer to the map below for estimated transit times. Customer satisfaction is of the utmost important to us. For this reason, if you are dissatisfied with your product you may request an exchange or refund within 14 calendar days from the date of purchase and we will issue a refund for the cost of the product to the original credit card used and send a return shipping label. All oils must be returned in the original packaging, unopened and with seals intact. For orders placed in error, a restocking fee of $9.95 will be charged to exchange the product (or $5.95 for one bottle orders). For product that has been damaged during transit, please provide a photo and description of the damage and email us at help@oliveoillovers.com.